Today is the 8th of January. This marks five months until my due date, so I am 18 weeks into this journey—and what a journey it has truly been! On top of typical pregnancy nausea, I was sick for quite a few weeks over the holidays. And then Snowpocalypse 2014 (as everyone is calling it) hit the Midwest, relegating us to life at home for a few days. Needless to say, the workouts have been a bit off these past few weeks. To keep myself motivated to reinstate a regular routine, I'm turning Wednesdays into "Workout Wednesdays" once again. The one major rule: Always touch base with your physician before trying anything new, and please make sure you proceed with caution in relationship to your own physical fitness. 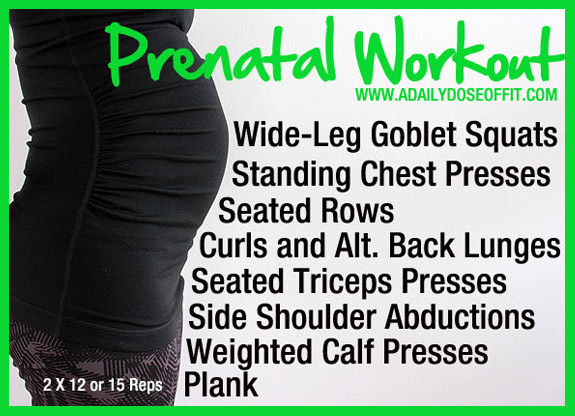 That said, today's Workout Wednesday will focus on prenatal fitness. Before we get to the actual workout, please head over to New Leaf Wellness. My guest post, "How to Exercise Safely During Pregnancy," will provide a boatload of information that's well worth reading. On to the workout: Please make sure you warm up before doing the following series of exercises. This is an especially important rule for pregnant women. And if you haven't eaten anything lately, you'll want to do that before you warm up. The exercises themselves will target each of your major muscles groups. They're somewhat basic in nature, but can all be done safely (assuming your pregnancy allows exercise). Do two sets of 12-15 repetitions, depending on your level of fitness. You will need a few pieces of equipment, mainly hand weights and a band with handles. 1) The standing chest presses and seated rows are meant to be done with the bands. If you're at the gym and have access to cable machines, feel free to use them instead. If you're at home without equipment, you can modify to pushups or bent rows...although you'll need to modify your pushups as the belly grows. 2) Curls and lunges...as you curl up, lunge back. Switch legs throughout. 3) Planks can be perfectly safe for pregnant women if you've been doing them regularly. You'll need to listen to your body and modify as needed. And be sure you're really, truly engaging your core in an effort to support your "hanging" belly! Now, however, would not be the time to start doing planks if you've never done them before. Sub in side bends to hit some of your core muscles, and really focus on engaging your core muscles throughout the other exercises. Your core plays a huge role in your balance...work your balance while you work other muscle groups and you'll consequently work your core. 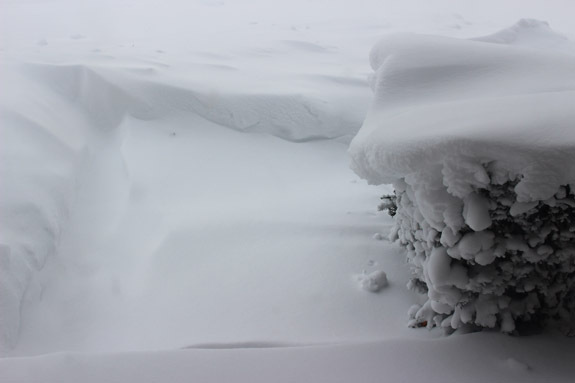 Question: What's the weather been like where you live? If you're forced indoors (like I am), what are you doing for workouts? It was negative 5 yesterday morning and then 2 this morning. Thankfully, we haven't gotten the snow, so I've been able to get to work and exercise! I taught my spin class for the first time in a few weeks yesterday and my toosh is sore this morning. I just taught my morning class and we did a bootcamp type workout. I did most of the moves, but if I feel maxed out, I slow down. Thanks for the prenatal workout. I'll save that one for when I can't make it to the gym. :) Hope your pregnancy continues to go well. Yeah, it's supposed to be 60 degrees and rainy here on Saturday. I'll take the rain as long as it's that warm! !